When I first heard about Izakaya Naru years ago, I will admit I dubbed it “Faux” Okinawan because the owner was from Tokyo and none of the staff were Okinawan. In this installment, I decided to give Naru a try and was pleasantly surprised! Photos by Todd Maeda Photography. View Izakaya Naru Photo Album. Eiji Yoshizaki, the owner of Naru has three other locations in Japan. He wanted to open a traditional izakaya in Hawaii and opted to go with an Okinawan concept because of the strong community here. Naru just celebrated their 4th anniversary. 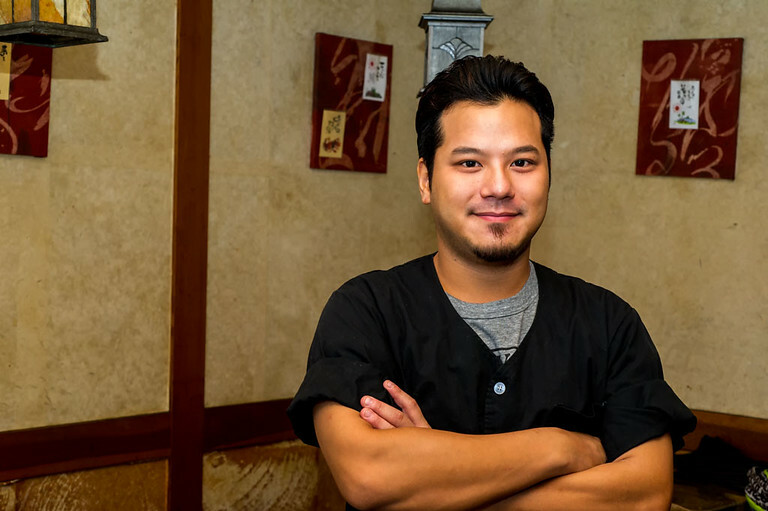 The manager, Hiro Akiyama, does not speak English (and my Japanese is abysmal) so I spoke to Chris Coty, one of the cooks. Turns out that Chris has family in Yomitan! 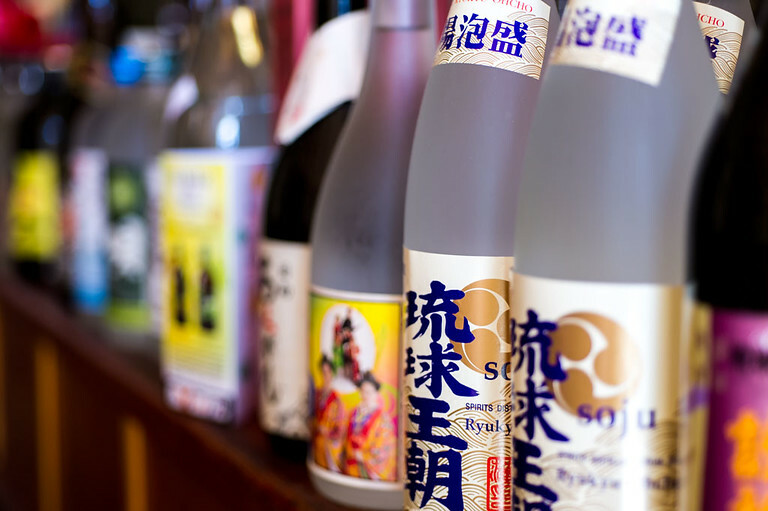 An izakaya is a place for people to drink, that also serves food to accompany the alcohol. In that, Naru is very different from Sunrise, Hide-Chan and Utage. Naru is open seven days a week from 5:30 pm to 2 am. They are located on King Street in a strip mall near University Avenue. There is a small parking lot but it is shared with Sushi King and other businesses. Street parking is limited. They accept cash or credit card (Visa, MC, Amex, JCB, Discover). The space is small, so make a reservation. There is seating for 25 people (if you squeeze in, then 30 people). Chris recommends calling 951.0510 at least 5 days in advance to make a reservation. For those who want to eat rather than drink, it is better to go early. As the evening progresses, it gets livelier and can be really noisy in the space. Take out is available for everything except the soba and taco rice. Tip: I noticed that regulars would call out to the waiter whenever they wanted to order or get refills, rather than wait for them to come by. I’ve heard from others that they thought the service was slow. 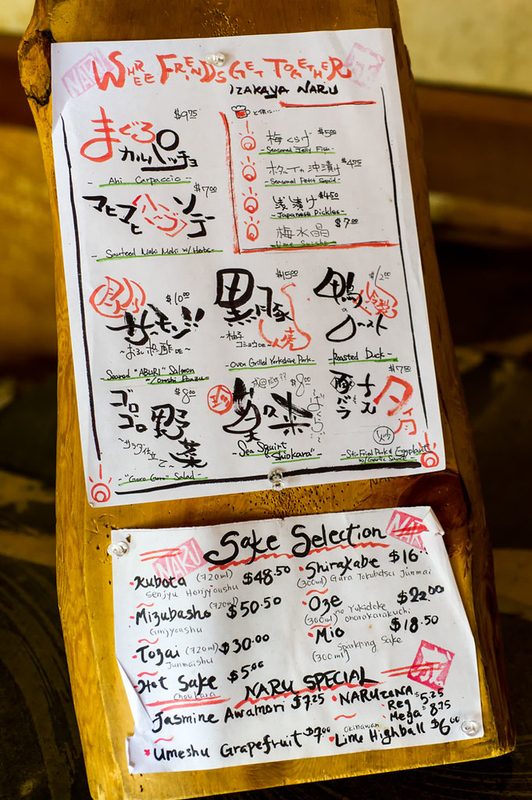 I’m thinking that at an izakaya, it is expected for the customer to yell for service. I’ll check on this. But in the meantime, don’t be leery of yelling to get attention! Take out is available for everything except the soba and taco rice. Naru has a variety of awamori labels. What interested me was their infused awamori. On offer was Kona Coffee, Shiso, Pineapple, Jasmine Tea, Kokuto Sugar, and Ukon (turmeric). The Kumesen awamori infuses with these flavors for a month before being served. Until you figure out your favorite, you can get a sampler that lets you pick three flavors. 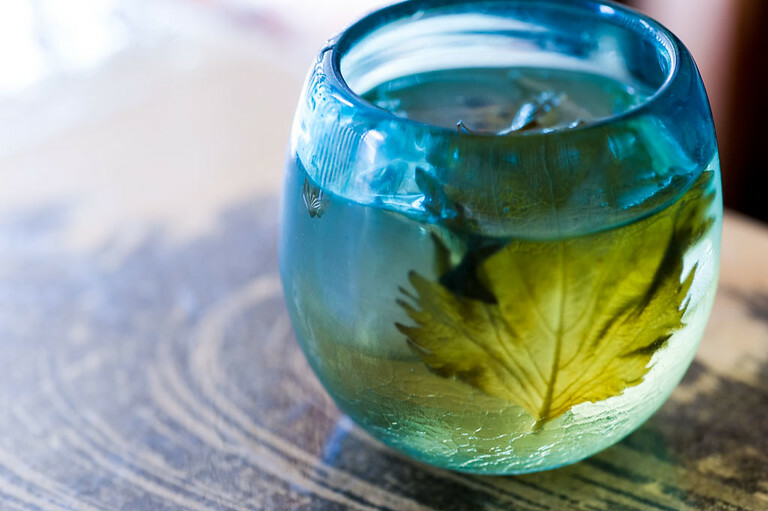 I tried the shiso and found the flavor was really pronounced in the awamori. Really nice. They also offer Orion beer. Looking through the menu, there are a lot of hidden treasures like mozuku and tofuyo which are brought in from Okinawa. They even have gyoza pizza! However, I am just going to focus on the following Okinawan dishes. Jimami Dofu. 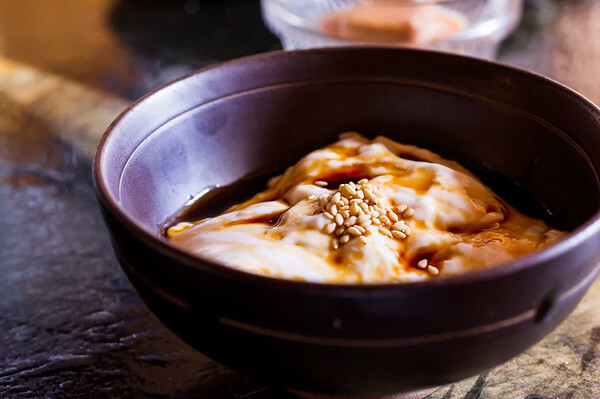 Naru makes this peanut tofu in-house. They serve it with a shoyu, sake, mirin, ginger and sesame sauce. As far as I know, they are the only restaurant here that offers Jimami Dofu! I really enjoyed the silky texture. Note: You can order this for take-out. Rafute. Naru uses a pressure cooker for their rafute. Pork belly cooked with shoyu, awamori, and kokuto (sugar). The pork was not as soft as other places but the flavor was very good. I liked that it was not overly sweet. There was a lot of fat on the pieces I got. Perhaps the fat did not render out as much in the pressure cooker? However, when paired with the soba, the rafute was perfect. Goya Champuru. Naru adds in Spam to their champuru, with the option to substitute with bean sprouts. 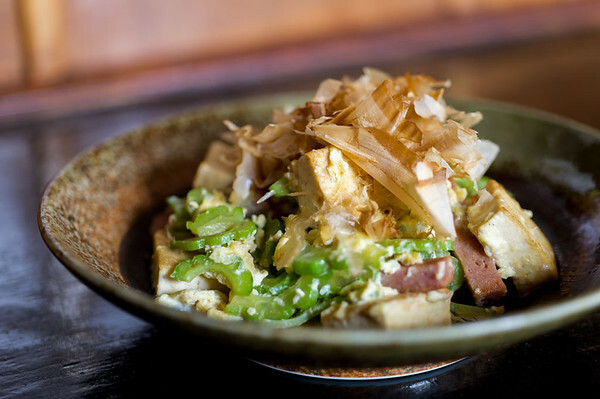 Chris sauté’s the large pieces of tofu and Spam. He adds in the goya, and then sprinkles on salt and sake to mitigate the bitterness. Dashi is added for seasoning. Eggs are added to the dashi, so they end up fluffy. The goya is cut thin, which I liked. When Chris was talking about how he prepares the champuru, there was so much passion and pride in his voice. Here is someone who started as a server and knew very little about Okinawa and is now passionate about cooking Okinawan dishes. I really respect that. Photographer Todd Maeda loved Naru’s goya champuru. 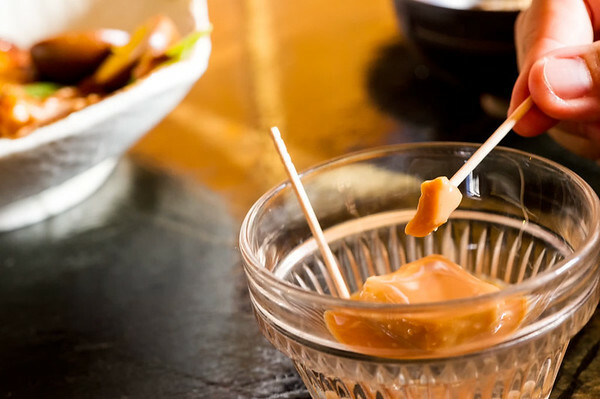 He referred to it as “Gateway Goya,” a not too bitter bittermelon dish that is a great way to introduce people new to goya to the dish. Taco Rice is a fusion between Tex-Mex and Japanese flavors. 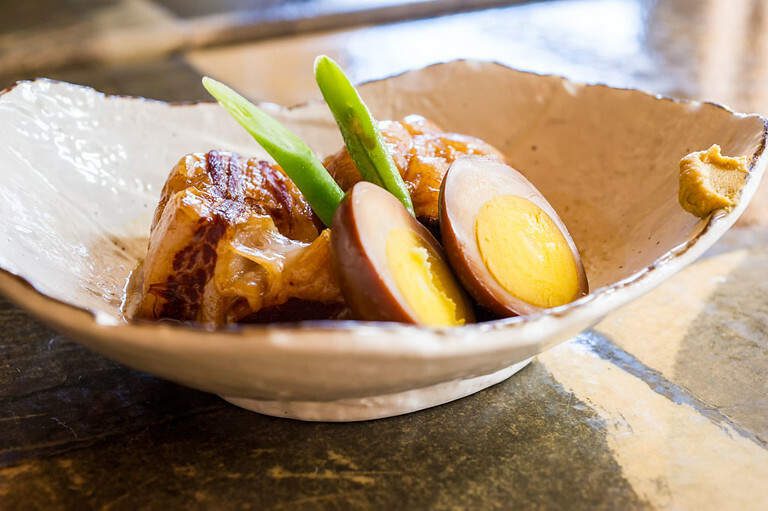 It is a really popular dish in Okinawa with locals and U.S. military personnel. Don’t confuse it with tako (octopus)! Think of it as the inside of a taco placed on top of white rice. At Naru, they give the dish a Korean twist by serving it in a sizzling hot stone bowl (like in bi bim bap). They layer in rice, seasoned ground beef, shredded cheese, lettuce, salsa and a raw egg yolk. 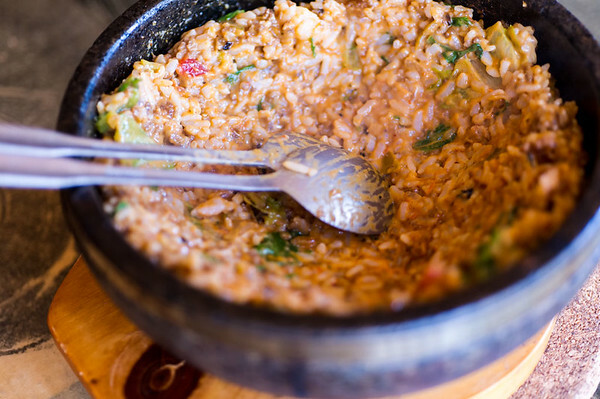 You can hear the rice sizzling against the hot stone as it is brought to the table, where the server then mixes everything together. The sizzling sound was amazing and the smell that wafted up was mouth-watering. 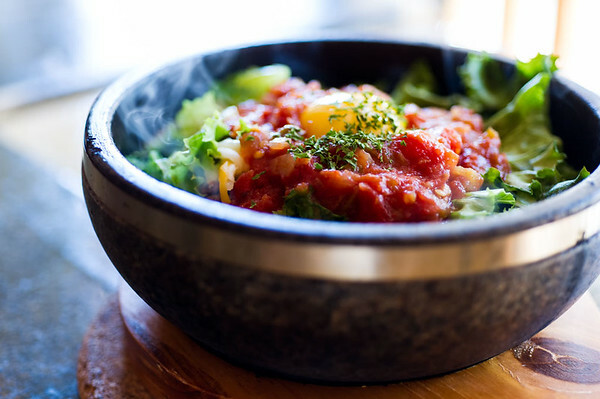 There is a richness of flavor from the meat and salsa in the dish, with a little spiciness. The lettuce does get cooked and leaves the impression of lettuce flavor. Thought it would be odd but it worked! I tried the original taco rice in Okinawa and prefer Naru’s version. The addition of the hot stone bowl is brilliant. We left our rice sitting for several minutes in the bowl while we took photos. I love it that way because the rice was crispier. I really recommend that when you order the taco rice, ask the server if you can mix it up yourself so you can let the rice sizzle and get crispier! Okinawan Soba. 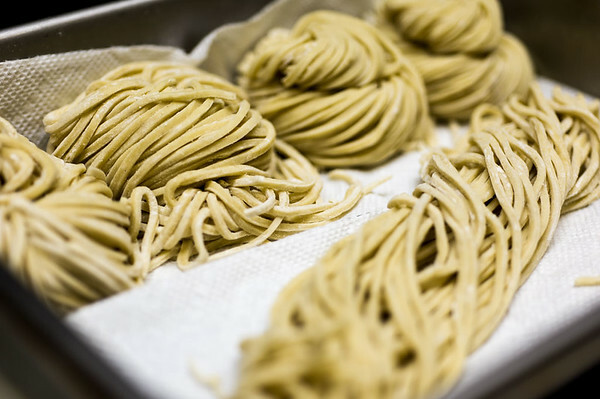 The soba noodles are made in-house every day! Naru’s is not wavy or yellow like Sun Noodle soba (which is what the other Hawaii Okinawan restaurants use). It has udon texture with the flavor of egg noodle. There are four options for toppings: Souki (sparerib), Kakuni (pork belly), Stir Fried Veggies and Tofu. The broth was not heavy but light and flavorful. The noodles were lovely. AND THEY ARE MADE FRESH EVERY DAY! Note: They do serve andagi with vanilla ice cream, kokuto, kuromitsu and kinako. I didn’t try it. If anyone does try, please let me know how it is! I am assuming the andagi is pre-made. Specials Board: Special dishes are usually available for a couple of days. When it runs out, they make something new. Specials are based on what they find at the market, something they want to try and make, or something popular brought back. Watch out for Pig Feet Karaage!